Visit Lapland in stunning Finland and meet Santa in his hideaway home in the snow-dusted forest on one of our magical holidays – it’s the ultimate Christmas gift to your family! When you visit Lapland with us, you’ll stay in the real winter wonderland of Saariselkä. Deep inside the Arctic Circle, Saariselka has a fairy-tale winter landscape of traditional log cabins, snow-sprinkled wooded fells, reindeer and elves, as well as all the fun and activities to make the most memorable Christmas trip ever. You’ll even get an Arctic Crossing Certificate! Don't forget to post your letters with your Christmas wishes to Santa before you leave – they will get to him via his special Christmas Magic Mail – in time for your private family visit to meet him. You’ll be welcomed at Ivalo Airport by Santa’s reindeer, one of his elves and a traditional Sami guide – remember to take some photos as your children’s eyes widen with amazement and pleasure! Saariselkä is home to Santa’s northern tribe of Saari Elves, a lively lot, whose ears and noses don’t grow so long as in other tribes, because of the time they spend outdoors. Santa’s elves will help you search for him and you can ride a snowmobile-sled or glide along by reindeer sleigh to find his cosy log-cabin in the snowy woods. The elves will probably be out playing snowball games when you swish by, so duck if they throw one! Santa will be looking forward to your visit and he’ll have the letters that your family have written to him, ready for a good old chat about your Christmas wishes. He’ll also give the children a special Lapland present that has been carefully made by his toy-maker elves. You can take photographs of everyone together so that you’ll have the evidence of your magical meeting for years to come! Explore the elves’ favourite Igloo Fantasia too – the igloo they call Elf Wonderland is where they make and wrap many of Santa’s presents (in between being cheeky!) and you can join in the fun and games. Artistic Igloo, meanwhile, hides a magical array of incredible ice sculptures – and a welcoming Ice Bar to enjoy warming drinks and tasty snacks. 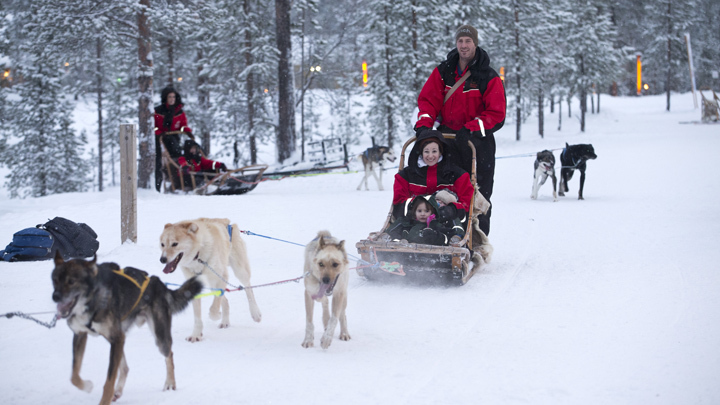 You’ll have many exciting experiences when you visit Lapland. Come to the Reindeer Barn & Centre where you can meet Santa’s reindeer, feed them favourite treats and learn some reindeer secrets. Take a mesmerising Husky Sleigh Ride and feel the sheer thrill of being pulled by a team of bright-eyed, bushy-tailed Huskies. The children will love steering their own mini skidoos, while the adults can have their own adventures driving a snowmobile. And everyone will have fun tobogganing! You should also definitely try ice fishing and snow hockey. There may even be time to squeeze in a bit of skiing. When you visit Lapland with us you’ll see some of over 190,000 reindeer that live there - and you’ll definitely visit the one and only Santa Claus living there! The number of reindeer in the province roughly equals that of the people. Reindeer sleigh rides are an ancient Sámi way of getting around. The Sámi are the only indigenous people of the European Union and several thousand live in Lapland. They have their own culture, language and folklore and it’s said that you can even tell where a Sami man is from, whether he’s married and how many reindeer he has from his traditional costume. In December you can experience the magical twilight effect of The Polar Night (“Kaamos” in Finnish), which is a period of no sunlight. Festive, twinkling lights glisten on the snow instead – and what’s more, you may catch the ‘Aurora Borealis’. Aurora Borealis, aka the Northern Lights, is a natural phenomenon created when solar particles collide with the earth’s magnetic field. Although it can’t be guaranteed, December is one of the best times to see them, and Saariselkä is an ideal location, being one of Lapland’s most northerly resorts. You can stay in Star Arctic Hotel, which has massive windows to view the Northern Lights. Another great way to search for the ‘Lights’ is to take an optional evening snowmobile expedition. 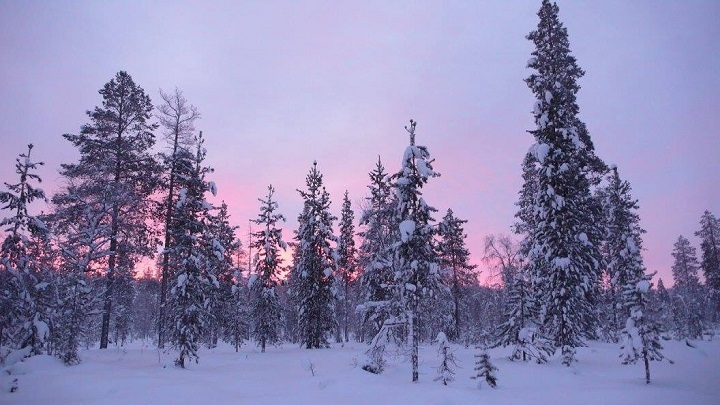 The amount of snow when you visit Lapland will brighten up the darkest of nights – in fact there are probably 50 shades of white and over 50 words for different types of snow in the Finnish language. If you want a bit of peace after your day’s activities, you’re never far away from purest silence – being in such a remote part of the world you only have to take a short walk to find yourself in pristine wilderness. We offer three or four-day adventures - you can choose between Santa’s Magic or Santa’s Aurora trips, both with fantastic optional activities, staying in a family-friendly hotel or woodland log cabin. Don’t miss the chance to visit Lapland with your family and see Santa while your children are still young – it’s definitely a trip of a lifetime for everyone. Book early for extra discounts off children’s prices.